Meet Whizbee, my new fuzzy (and stinky) pet, I got him and his little brother for Christmas! They are really up to no good what I love, they harass the cats as much as they harass them, love it! The TopShop brogues are fake leather/plastic and run a bit small (for me half a size bigger would be perfect) so I can’t walk a whole day on them. ohh… what amazing pictures! love this! how cute? I love the photos. that mouse is tooo cute!! good god, that little thing is just too cute! i love this! those shoes are so great. and that mouse is adorable! cute little mouse and nice pair of shoes you got there. OMG! you really have this creature at home??? It is sooooo cute!!!! These pictures made me smile! That mouse is too cute and the oxfords are perfect! How cute is that! Really nice shoes. I used to have one named nico and they are the cutest thing ever! Wonderful shoes, and Whizzbee is absolutely adorable! Do you really have cats, too? That’s amazing that they live together in harmony, hah. Haha, fun idea with the pictures. Fun shoes! Whizzbee is adorable! makes me want to get a mouse myself. Shoes are great too.. i want those as well! And i just want to say you look great in that Anywho/Kibra jacket! i just ordered the same one in camel yesterday. I´m so excited about it! adorable mouse <3 his so cute ! 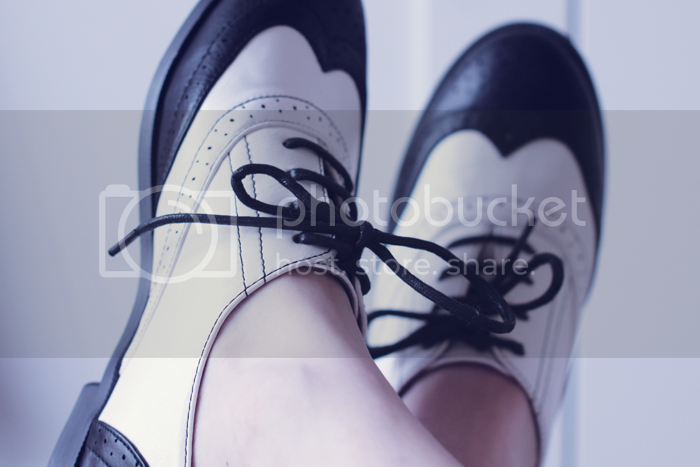 And I love this derbies! Thanks to share all this amizing pictures and outfits with us! I am starting to think we have the same taste of shoes! Brogues in silver was a recent purchase of mine 🙂 However, these are even more fantastic! And the tiny cute mouse in it… super photos! 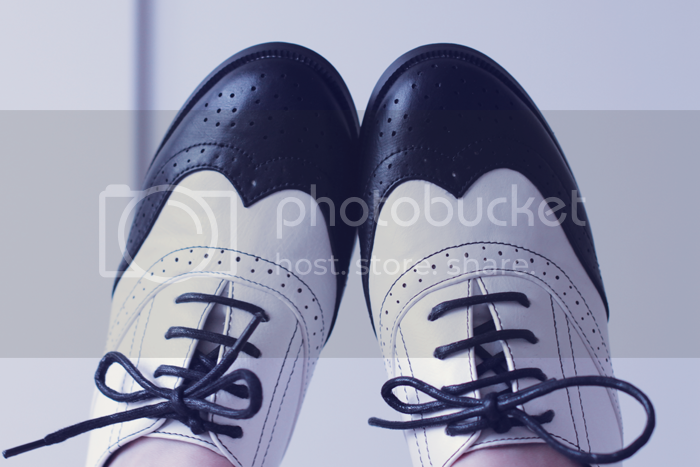 have you thought about using leather paint to repaint a pair of vintage/thrifted brogues to your liking? I’m sure with your creative background it would turn out fantastic! That mouse is SO cute! Love the shoes, too bad about the material! 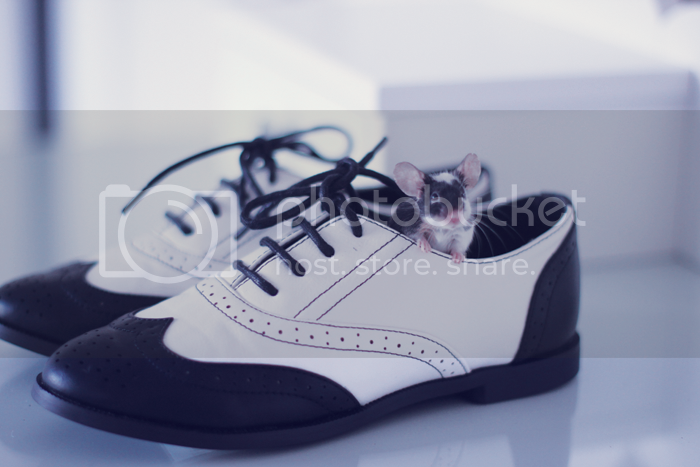 Cute mouse and shoes! I wish mice didn’t smell so much, they are adorable! Oh my he is soooo adorable!!! I love these photos! I need a good pair of brogues as well, these pair are really cute, but I understand how the price tag doesn’t fit the materials. Check my blog out, follow! What an adorable little addition! That is the cutest mouse ever!! And the name is adorable. Whizbee is a natural. What a cutie. Well I love Whizzbee of course. I can’t think of a better model. I didn’t think he was real at first. Whizzbee is the cutest mouse i’ve ever seen! Whizzbee is so cute! And luv ur shoes!